Pam wanted to design a dress ring using the gold from her late husband's wedding ring. She wanted the ring to commemorate him and as she already had an engagement and wedding band she was keen for a completely unique design. 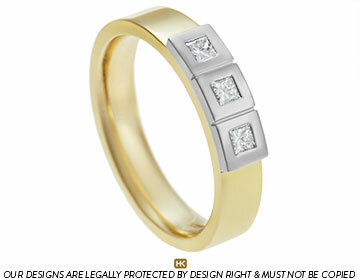 A new platinum setting has been added to the special 9 carat yellow gold band. Within the setting are three 2mm princess cut diamonds, weighing 0.18 carats in total. A polished finish completes this sentimental design.